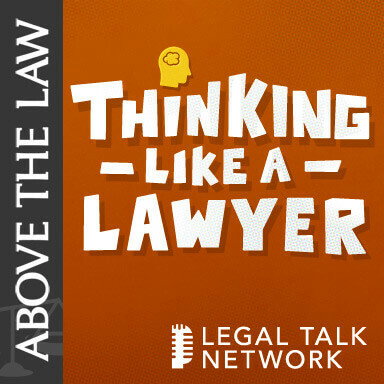 Thinking Like A Lawyer is a podcast featuring Above the Law’s Elie Mystal and Joe Patrice. Each episode, the hosts will take a topic experienced and enjoyed by regular people, and shine it through the prism of a legal framework. This will either reveal an awesome rainbow of thought, or a disorienting kaleidoscope of issues. Either way, it should be fun. Jonathan Shapiro talks about how a lawyer breaks into Hollywood and how penning lines for James Spader differs from practicing law. Ransomware attacks, data disasters, robot lawyers... Jeff Ton talks about what's on the horizon for technology in 2018. Is It Okay To Talk About Women In Law Now? Elie and Joe talk with Above the Law's Kathryn Rubino about the challenges faced by women who go into Biglaw. Joe and Elie talk to Cristian Farias about producing a legal podcast non-lawyers listen to, and explaining the Supreme Court to a law audience. In this legal podcast about law school, Ray English discusses when law students should start finding a job. How does one go from practicing law to writing about football? Hear from Ryan Nanni in this legal podcast. In this Above the Law podcast, Richard Hasen talks about the voting rights and redistricting battles being waged at the nation's highest courts. In this Above the Law podcast, Tejinder Singh discusses the relatively sleepy Supreme Court Term. This legal podcast discusses the Supreme Court's decision to challenge the the Professional and Amateur Sports Protection Act (PASPA). Harvard’s Accepting The GRE — How Much Should You Freak Out? This legal podcast looks at whether law schools should accept the GRE and the potential effect of this decision. Elie and Joe discuss the 2017 Above the Law law school rankings and the ATL methodology with special guest Brian Dalton, Above the Law's Director of Research. This legal podcast discusses whether using cops for promposals is counterproductive in improving people's view of police. Joe and Elie open the mailbag and answer questions from listeners trying to decide where to go to law school. Joe and Elie discuss how they chose their law schools, and how others should do what they say, not necessarily what they did. On this episode, PwC's Oscars mistake and why they still won't get fired. Willkie Farr's representation of Alma Kashkooli, a 12-year-old Iranian girl coming to the U.S. for surgery in the midst of the administration's travel ban. Elie and Joe talk about Apple, Samsung, knock offs, child labor, Melania Trump, and open toed shoes… in that order… with Fashionista editor Tyler McCall. In this legal podcast from the Above the Law blog editors, Elie and Joe award those in the legal industry who entertained us this year. Joe and ATL Editor Kathryn Rubino discuss Biglaw bonus season as firms place the final cherry atop associate compensation after a tumultuous year of raises. Libel law expert and former Bloomberg Global Media Counsel Charles Glasser talks about the future of the press. Joe and Elie talk to fellow ATL editor David Lat about the recent APP Conference in Philadelphia bringing together practitioners and thought leaders to discuss the future of legal practice. And Elie and Joe argue about public schools. What’s Up With The Philadelphia Market? Joe and Elie discuss the Philadelphia legal market with attorney Steven Silver. Elie and Joe chat with SCOTUSBlog contributor and Supreme Court litigator Tejinder Singh about the upcoming Supreme Court Term. The docket lacks the blockbuster issues of past years, but there are still some critical cases pending before the 8-member Court. Is LegalZoom Ruining The Legal Profession Or Enhancing It? 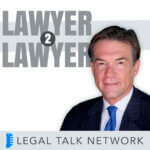 Joe Patrice brings on Chad Burton and Nicole Bradick of CuroLegal to cohost a wide-ranging discussion with LegalZoom General Counsel Chas Rampenthal. Joe and Elie debate the Clinton Foundation, back to school issues, and the efficacy of taking classes with “famous” professors, just so you can name drop at parties. Joe and Elie chat with attorney Drew Rossow, author of Gotta Catch... A Lawsuit?, about the legal challenges surrounding Pokémon Go. Elie and Joe chat with Professor Bill Henderson, an expert in legal industry economics, to discuss the recent increase in associate salaries. From summer associate etiquette to proper lunching locations, to living as a full-time associate in a world of summers, Joe Patrice and Kathryn Rubino discuss how to tackle the summer and reminisce about their own summer adventures. Joe and Elie chat with Research Director Brian Dalton about the latest law school rankings from Above the Law and trends in legal education. Do you want to know where you should go to law school? Do you just want bragging rights over your colleagues from rival schools? Either way this podcast is for you. Joe and Elie chat with Dean Strang, the breakout legal star — if that’s the right word for a documentary — of Netflix’s Making A Murderer. Along with attorney Steven Chung, the gang chats with Strang about the state of the criminal justice system and the persistent plague of prosecutorial overreach. Joe and Elie chat with election law expert Professor Rick Hasen about the Iowa Caucuses, Ted Cruz’s infamous mailer, and Citizens United as the presidential election kicks into gear. Do Droids have rights in the Star Wars universe? Are they “pets?” Does Jabba’s treatment of droids reveal him to be more evil than the Empire? Spoilers follow. With the Court seemingly poised to strike down affirmative-action in Fisher v. Texas, Elie, Joe and Renwei Chung debate how we got here and the future of diversity in higher education. Elie and Joe chat with Robert Schenk of Schenk Smith and proprietor of the Wedding Industry Law Blog about the oft-overlooked legal minefield that is getting married. Venues, vendors, and “DJ-Gate” loom large as Schenk explains how he found this niche and used it to build his small firm practice. Joe and Elie chat with Gary Ross of Jackson Ross about starting your own firm, the unique challenges of transactional small law, and his blockbuster Above the Law column about legal sexual prowess. Joe and Elie talk with Vanderbilt Career Services Officer Nick Alexiou about the legal job market, and the presidential job market. Supreme Court Preview: Revenge of the Roberts! Elie and Joe complain about the media’s abysmal coverage of court cases before previewing the upcoming Supreme Court Term with a real-life Supreme Court litigator, Tejinder Singh, a partner at Goldstein & Russell (http://www.goldsteinrussell.com/attorneys/tejinder-singh/) and contributor to SCOTUSBlog. What’s next for the Supreme Court? If you said, “a lot of pro-business decisions” you’re probably right! Elie and Joe talk with Steve Silver of The Legal Blitz about all the off the field problems associated with “OMG I think that’s brain coming out of his ear”-Ball. Is The Office Thermostat Sexist? Joe chats with Kat Griffin of Corporette about women’s professional fashion, the confusion of business casual and whether office temperatures unfairly target women. Joe and Elie take a break from the usual format to face off in a trivia challenge. Do you know your constitutional amendments? How about your Supreme Court history? Play along at home.